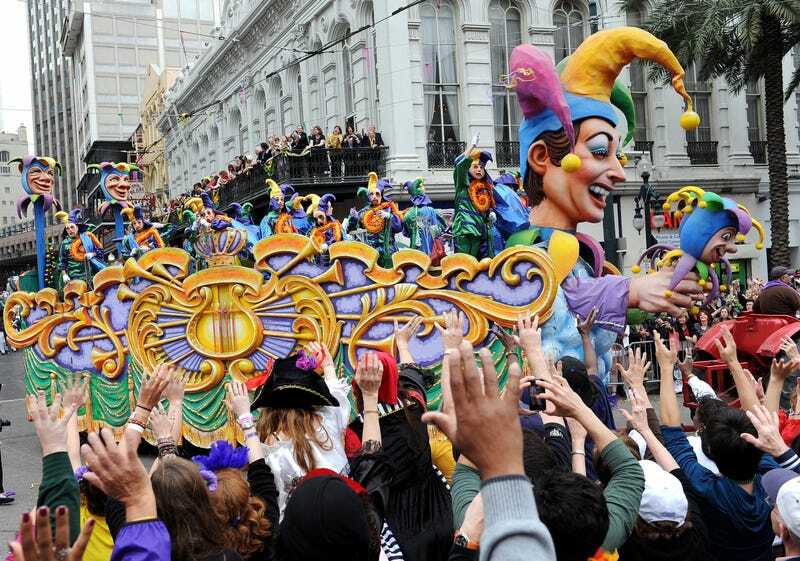 The Associated Press reports that revelers partying on Fat Tuesday in the French Quarter included some BP-oil-spill-inspired political humor with this year's parading, costuming and drinking. Among the costumes were a "one-man cleanup crew" ("The only thing I had to shop for was the Jim Beam, and that was to ease the pain of the oil spill," the reveler wearing it said) and oil-stained jumpsuits, adorned with plastic birds and crabs, worn by two women. Sylvia Beyer, 57, of New Orleans led a group of five women in grass skirts and hats with the BP logo. The backs of their shirts included messages like "Broken Promises," "Brazen Polluters" and "Bloody Pathetic." "We just wanted to stick it to BP. We put more time into these costumes than BP did in their disaster plan," Beyer said. They even passed out makeshift voodoo dolls representing former BP CEO Tony Hayward. Although this has been called the most successful Mardi Gras in years, many locals are still feeling the effects of the spill (not to mention Hurricane Katrina). That participants have been able to combine reminders of that troubling fact with an economic boost for the region, tradition and a good time is an accomplishment worth celebrating. In other news: Multicultural-Marketing Pioneer Herb Kemp Dies.